As the seasonal autumn chill starts to kick in, a changing of the guard begins in avian circles, with some species heading off Southward for a warmer spot for the winter, and hardier species starting to fly in to replace them. One place which is regularly rich with birds is Mount Pond on Clapham Common. 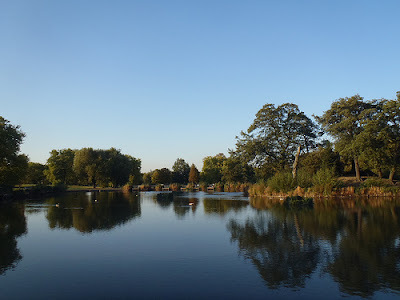 Though the Pond has been closed to anglers who usually catch carp, roach, tench and bream there, for the summer due to low water levels, that won't stop geese and ducks who can regularly be seen on the pond in all seasons. As we saw previously, Mount Pond has a long history, and it is possible that it was used for scientific experiments by Benjamin Franklin in the 1760s or 1770s. It has always been a haven for wildlife and the Environment Agency undertook work last year to ensure it remains suitable for fish, amphibians, insects and plant life, all of which play an important part in the ecosystem which brings the birds here.